LAS VEGAS--(BUSINESS WIRE)--Jan. 5, 2016-- The words ‘Las Vegas' and ‘quality sleep' aren't typically found in the same sentence. But this week, tech-savvy enthusiasts looking for better sleep have found it at the 2016 International Consumer Electronics Show (CES) — the it™ bed by Sleep Number. It effortlessly quantifies your sleep, connects to select applications, and has predictive modeling that makes suggestions to improve your sleep. And unlike ordinary mattresses, you can adjust each side of the it bed to your individual preference – which takes the worry out of an online-mattress purchase. "The it bed is made for the millennial customer who believes quality sleep is essential to their health, wellbeing and overall performance," said Shelly Ibach, president and chief executive officer, Select Comfort. "We expect this generation, more than any other, to demand more from their mattress. The it bed makes you smarter about your sleep, connects to your outside world and offers a holistic view of how your day impacts your sleep — all at an incredible value." SleepIQ® technology — SleepIQ technology integrated into the bed tracks your sleep, offers insights and makes suggestions for the best sleep of your life. Touch-free, biometric sensors track your whole body hundreds of times per second (heart and breathing rates, presence and restfulness). Based on your individual SleepIQ® data, the technology learns your routine, and uses adaptive algorithms and predictive modeling to recommend adjustments to your daily habits and environment. ActiveComfort™ technology — The it bed has dual, foam-filled air chambers that respond to individuals' constantly changing needs and adjust to your ideal level of comfort, firmness and support (your Sleep Number® setting). SleepIQ® API — With SleepIQ API (Application Program Interface) on the inside, you can connect to your world outside and track items important to you — individualized comfort, exercise, nutrition, environment, schedules — to make you smarter about your sleep. 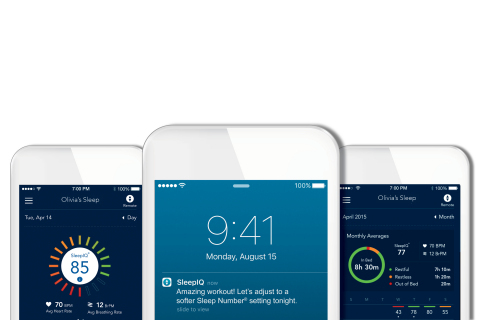 Based on your daily activity, SleepIQ technology makes recommendations for your best night's sleep. For example, after a hard work out, SleepIQ technology might suggest a different Sleep Number setting and going to bed earlier to recover. And research shows that when Sleep Number customers adjust the firmness of their bed, they are 58 percent more likely to improve their sleep quality. "Today, we collect more than a billion biometric data points a night, and this next step in expanding our technology platform will further strengthen our data analytics to deliver even better individualized sleep solutions for our customers," said Ibach. "This is an exciting time where we see people adopting technology to improve individual health and wellness faster than ever before." The it bed will be exclusive to Sleep Number and will be available at itbed.com for around $1,000 later in 2016. It will be delivered to your doorstep and can be assembled in minutes. In addition, the advanced SleepIQ technology — with the new predictive modeling — will be available to all current SleepIQ users as a software update in 2016. Media Note: For media materials including videos, images, survey results, a fact sheet, an infographic and sleep tips, visit: SleepNumber.com/CES2016. In partnership with YouGov, Sleep Number conducted an online survey of 1,079 Sleep Number customers that use SleepIQ® technology to understand what drives changes in sleep quality (measured as restful time in bed) and understand behaviors and attitudes of sleepers who have both improvement and decline in sleep quality. The sample was randomly selected from two groups of SleepIQ technology customers, and uses SleepIQ® data from June 2015 and September 2015.